A place that can be equipped solely to suit personal habits, preferences and interests, which has many flexible planning and integral solutions, designed from the highest quality materials with an unmistakable design – +STAGE does it all! With this innovative concept, Poggenpohl offers the utmost in individuality and consistently embraces the changing demands on the home environment. Flexibility and distinctiveness are becoming increasingly important; the individual functional areas created by +STAGE dissociate to form separate elements. In developing +STAGE, Poggenpohl very deliberately focuses on modern living, concentrating on all that is essential and valuable within home life. Activities formerly carried out in different areas are grouped together within a compact space 120 cm wide creating a stylish setting. The highly functional theme units are equipped with slide-in hinged doors, called pocket doors. They can be positioned and combined in both the kitchen and living area and blend harmoniously into a tall unit line or can be deliberately visually accentuated as a stand-alone unit. The functions of +STAGE can be individually defined and grouped together by means of specially developed equipment features. Poggenpohl offers the complete theme packages of “bar”, “office”, “breakfast”, “wardrobe”, “kitchen” and “tea” as a design basis. “With the different themes, we illustrate how +STAGE can be set in scene, in the full knowledge that there are countless ideas and possibilities of fulfilling one’s own unique personal requirements,” Christiane Danielsmeyer, Poggenpohl Marketing, explains. Four tall unit heights and the standard unit depth of 65.4 cm are available based on the Poggenpohl range. +STAGE can be ordered in all conventional front colors. 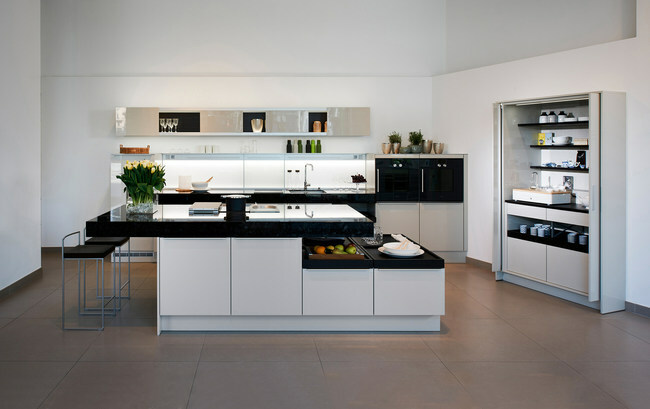 Poggenpohl has been designing and producing luxury kitchens at its factory in Herford, Germany for over 120 years, making it the world’s longest-established and most renowned kitchen brand. Customized, high-end kitchens delivered to more than 70 countries are created in a manufacturing and assembly area of 54,000 m2. A global network of 450 Poggenpohl studios with highly skilled designers fulfills customers’ ideals of a tailor-made kitchen.